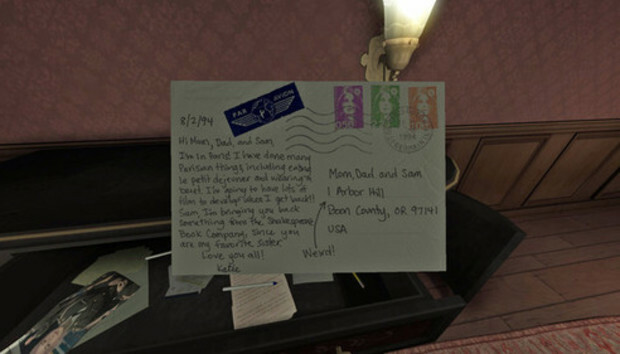 Gone Home, the debut game from the Fullbright Company, is a first-person "adventure game" that challenges you to explore your family's house in 1995-era Portland. The small, four-person team of developers, mostly veterans of the excellent Bioshock 2 DLC Minerva's Den, call it a "story exploration game." You play as Katie, recently returned from a trip abroad to an unfamiliar house--both her parents and her younger sister have moved away while she was out of town. When you get home, the house is empty and a note on the door from your sister says, "I'm sorry I can't be there to see you, but it is impossible. Please, please don't go digging around trying to find out where I am." From there you wander your family's home, examining the various artifacts of modern life that families tend to accrue over the years, slowly piecing together the full story. You'll never meet your family members--your mother Janice, your father Terry, or your sister Sam--but each of them has a fully realized, complex character arc explored through the random documents you read, and (in Sam's case) the occasional "audio recording" doled out after handling certain objects. Gone Home is what happens when you take the excellent incidental storytelling of a Bioshock game (or Elder Scrolls, for that matter) and stop shackling it to a game-y combat system. You don't fight any enemies here, or burn the house down. You read. You experience. You walk around. As a result, the Fullbright crew is able to tell a poignant, realistic story to those with the patience to experience it. This is maybe the first time I've ever associated the words "slice of life" with a game, but it works--for the most part. Not having access to a run button takes some getting used to--and it makes some sections of the game feel tedious--but it makes sense in the context of the story. There's not much else you can discuss about Gone Home that isn't a spoiler, considering it's all story. In light of that, I've decided to present this review a bit differently from my standard 1,800 word essay. I've scanned some documents to share with you, some that I originally made in preparation for writing this review, others that I had sitting around my apartment or on my hard drive. Maybe this will give you an idea what it's like to play Gone Home by reconstructing my own play experience. Don't enjoy the format? That's fine. For those looking for a traditional article, both Polygon and Giant Bomb published excellent reviews that echo how I feel about this game. Basically, just play Gone Home. It's gorgeous. One last note: props to Chris Remo for another fantastic soundtrack.